1. The whole line adpot the computerized controlling system, can fulfill fiber carding, fiber rolling, automatic filling into pillow and cushions. Suitable for pillow & cushion�s filling. 2. It is easy to adjust the fiber filling weight. 3. After rolling filling, the pillow and cushions will be incredibly even. The filling effect is superior than using other filling machine is. 4. 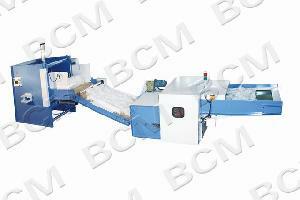 The fiber carding machine equipped with metal detector and overload devices, can prolong the machine�s life-span.